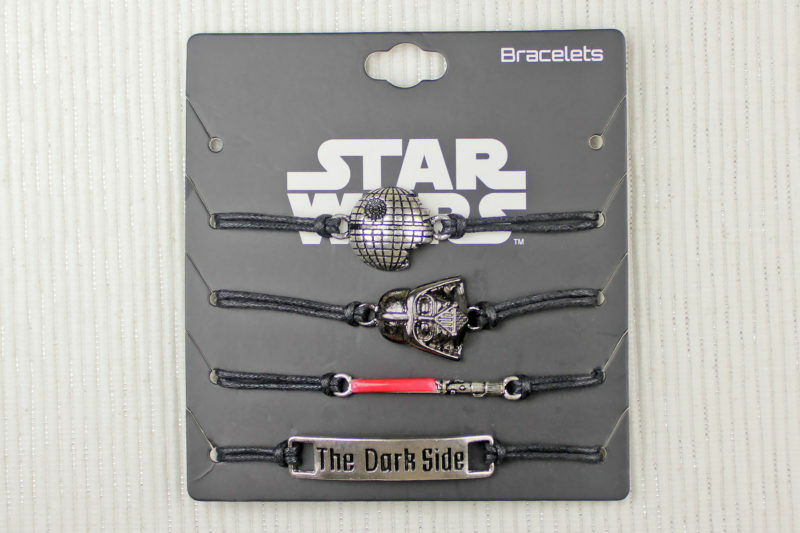 Today’s review features the Star Wars Dark Side bracelet set. 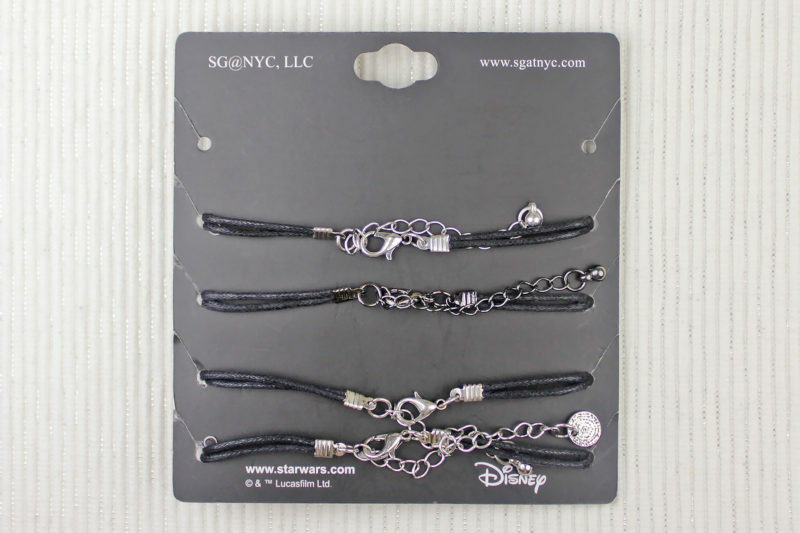 Made by SG@NYC, the set includes 4 bracelets, each with a Dark Side themed central pendant. I quite like jewelry sets – multiple choices for the one price! You can wear these bracelets all stacked together, or just one at a time for a more subtle look. I have a soft spot for lightsaber themed accessories, so I had to have this set! Come to the Dark Side. We have a cord bracelet set from Star Wars with Death Star, Darth Vader, lightsaber and “The Dark Side” pendants. The set is available from Hot Topic, priced at US$10.50 per set – but it is currently on sale for only US$7.87 per set! Hot Topic can ship internationally, which is great. The set came packaged on a black cardboard backing card. The front features the Star Wars logo printed in white, while the back features the SG@NYC and Disney logos, along with website information. The bracelets are held in place with little slotted holes on each side of the backing card. 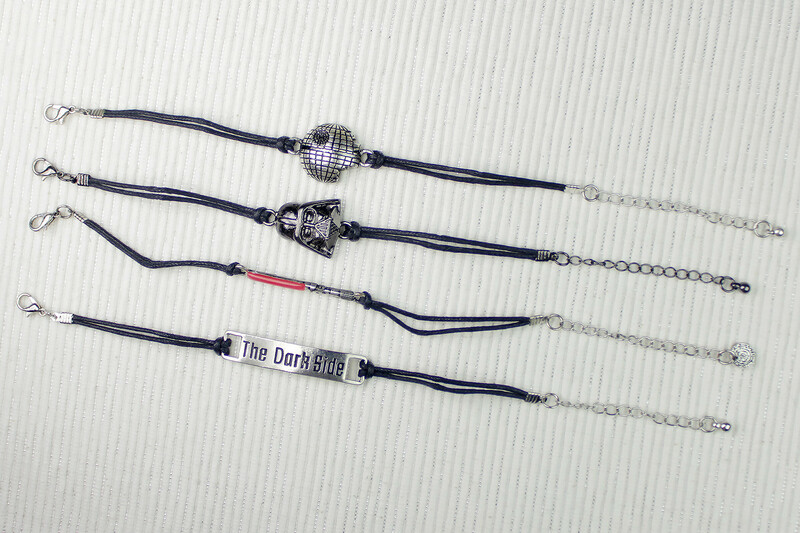 Each bracelet features a central metal pendant, with a different Dark Side themed design for each one – Darth Vader’s helmet, Darth Vader’s lightsaber, ‘Join The Dark Side’ text, and the second Death Star. 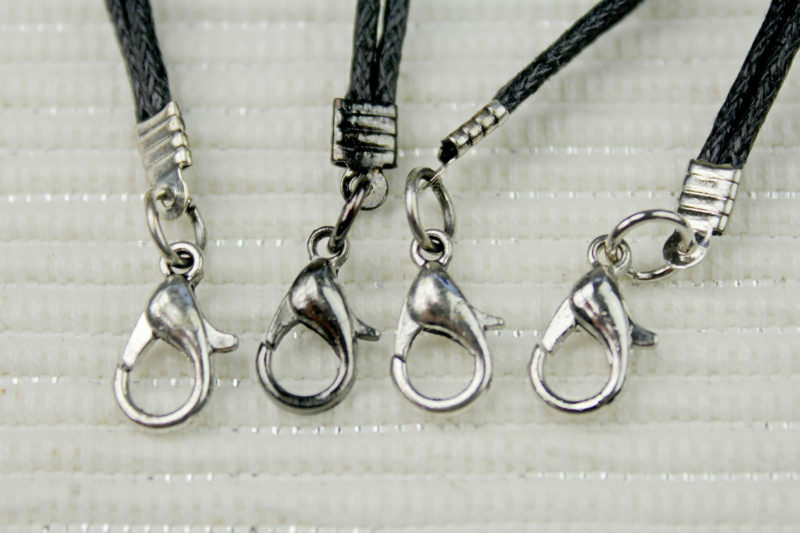 The pendants are held in place with a loop of black braided cord at each end – though I am not sure if this is real leather or faux leather cord. In my photos, the cords have a few kinks from being stored on the card, but these ease out nicely with weearing. The bracelets are adjustable, with a lobster style clasp at one end, and a short length of adjustment chain at the other end. 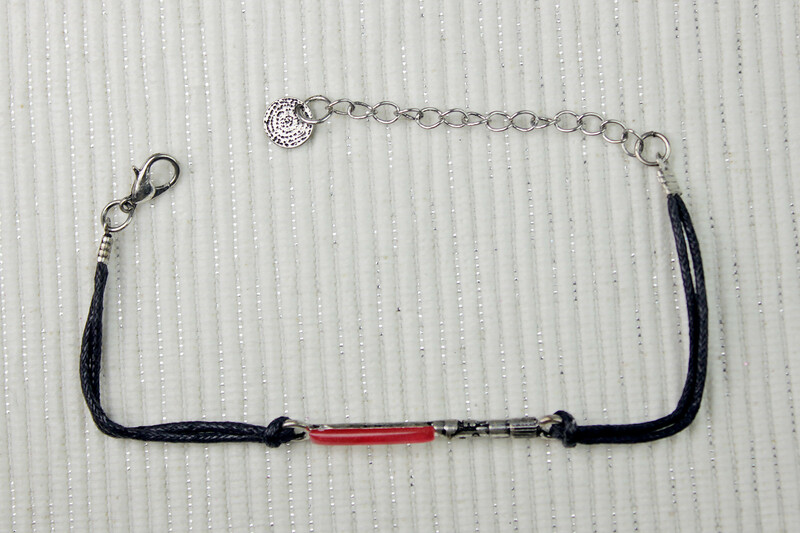 The bracelets each measure approximately 18.5cm long (including clasp), with a further 5cm of adjustment chain. 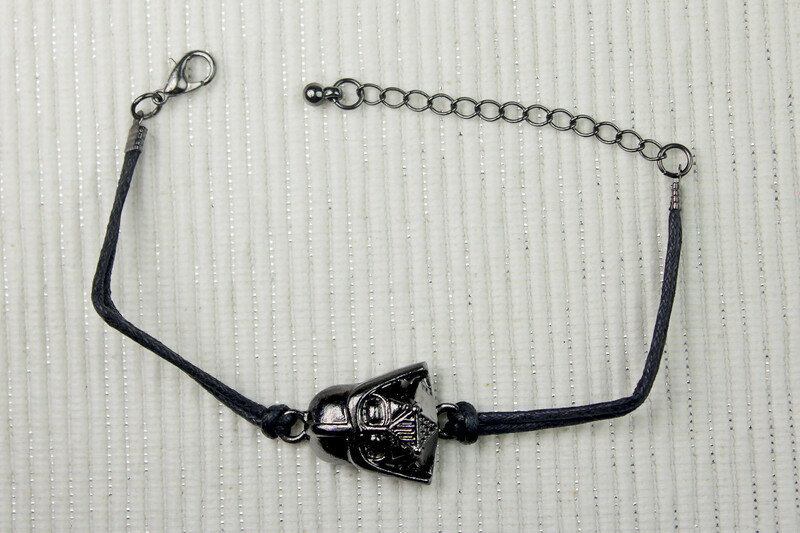 Interestingly, 3 of the bracelets use silver tone jewelry hardware (clasp and adjustment chain), while the Darth Vader bracelet uses dark gunmetal tone hardware. The Darth Vader bracelet features a 3D sculpted pendant of Darth Vader’s helmet. The finish is a very dark metallic grey, not a true black – it reminds me of the colour used for the Love And Madness Darth Vader necklace. 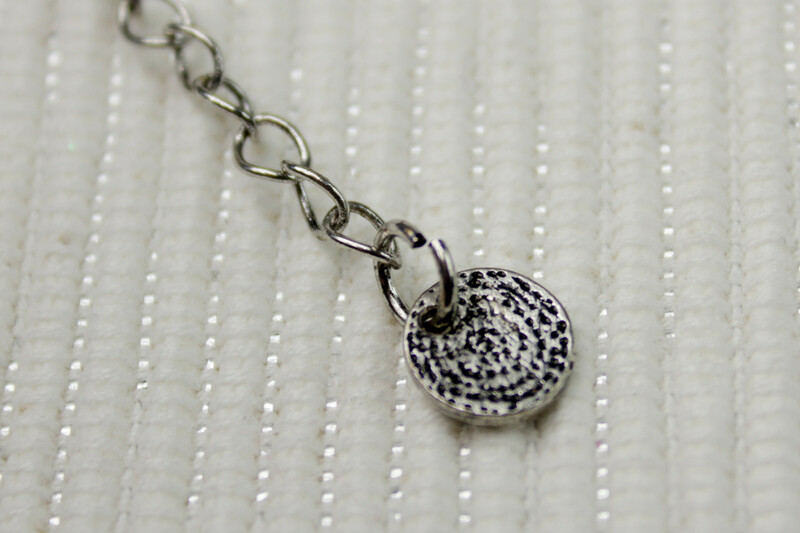 The back of the pendant is flat, so it sits nicely against your wrist when worn. 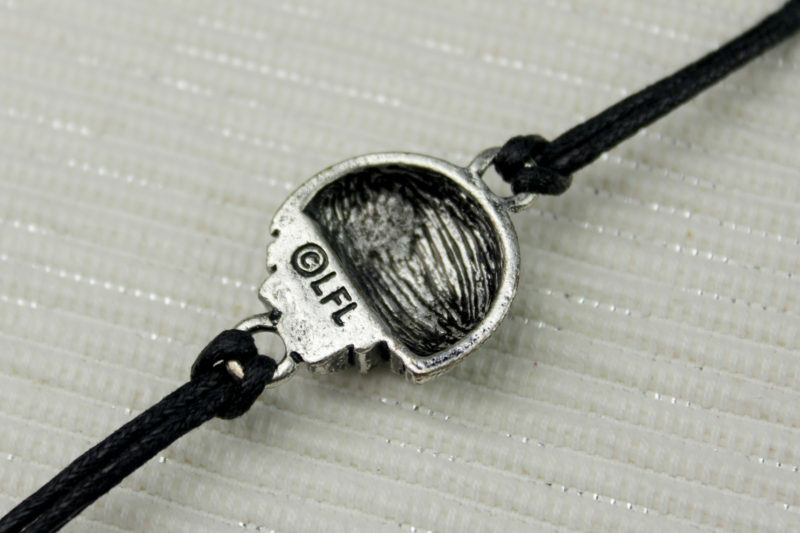 The back of the pendant is hollow to reduce weight, and features the ‘© LFL’ stamp. The helmet pendant measures approximately 2cm by 2cm (at the widest parts, not including the end rings). 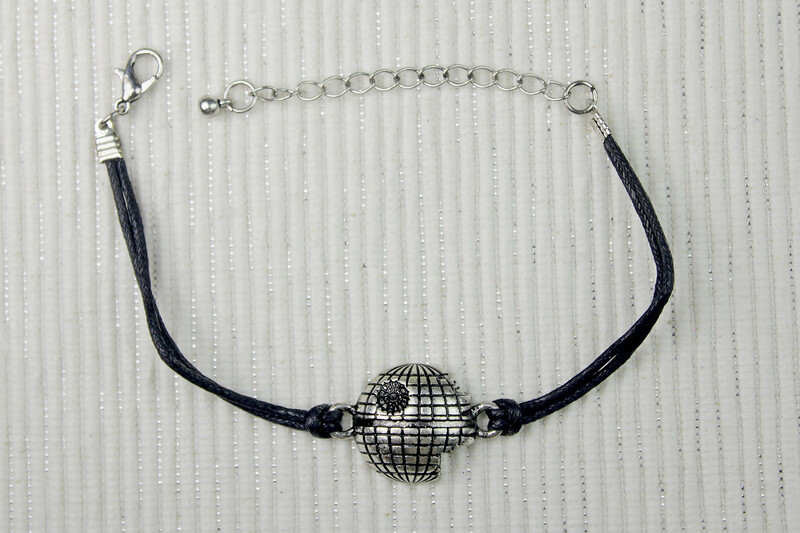 As mentioned earlier, this is the only bracelet to use a dark metallic tone clasp and adjustment chain – a good fit for the Darth Vader theme. 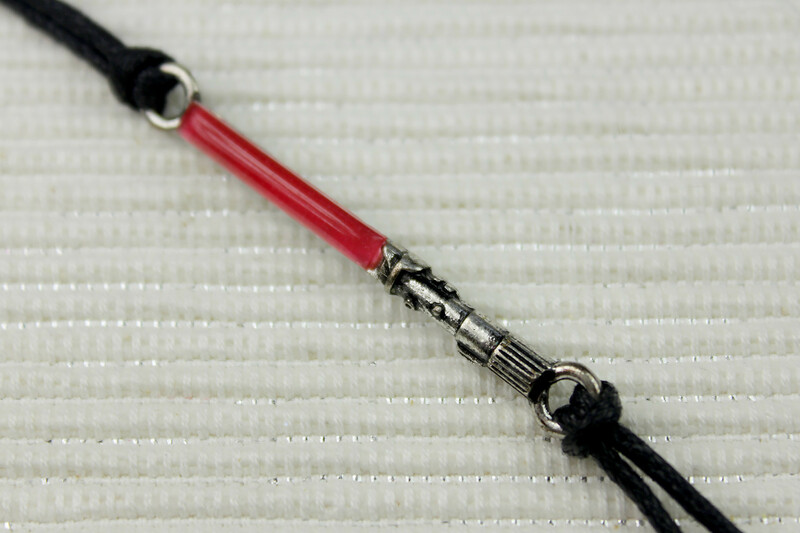 The lightsaber bracelet features a 3D sculpt of Darth Vader’s lightsaber, with a raised red plastic detail for the lightsaber blade. When viewed from the side, the plastic covering appears to have a red base, with a domed clear coating, which gives a rounded shape to the blade. The hilt sculpt is really nice, with the fine detail accented with black antiquing. The lightsaber pendant measures approximately 3.5cm by 0.4cm (at the widest parts, not including the end rings). Fans with slender wrists may wish that this lightsaber pendant was curved, as it sits straight across your wrist. 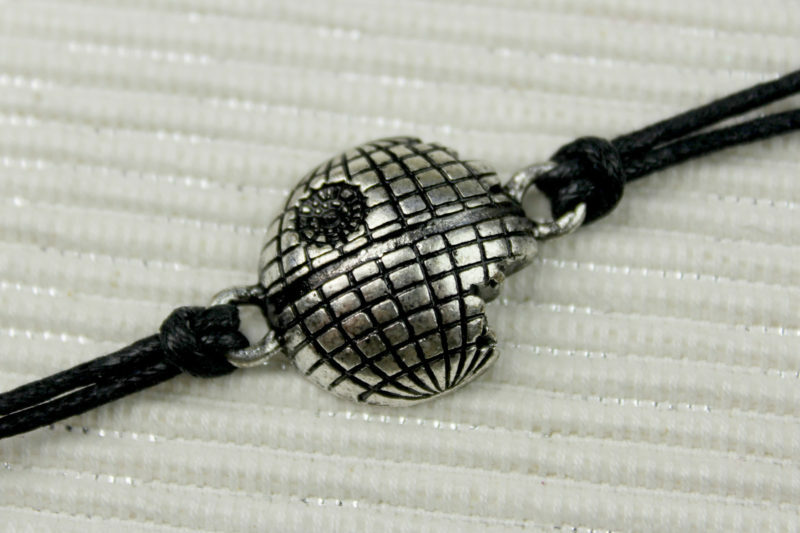 While the other 3 bracelets feature a small decorative ball pendant at the end of the adjustment chain, the lightsaber bracelet does not. 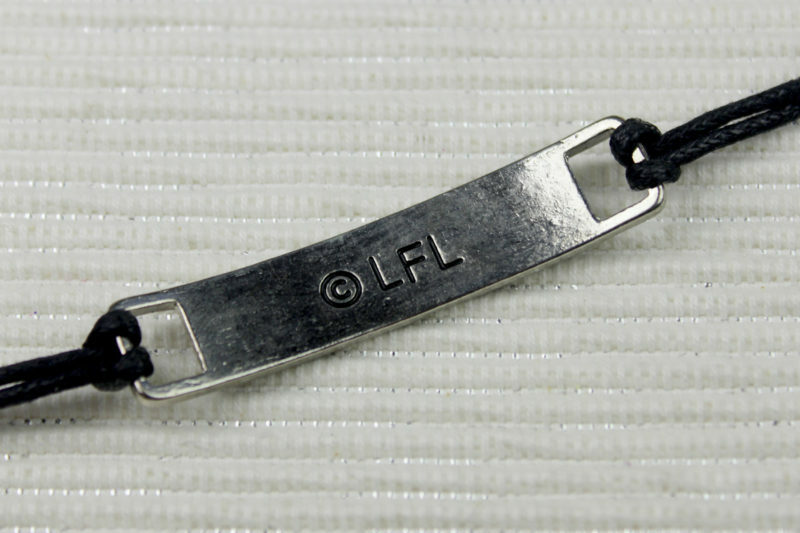 Due to its small size and flat textured back, the lightsaber pendant does not feature the ‘©LFL’ copyright stamp on the back. As there is a licensing requirement to have it marked somewhere on the item, instead there is a small circular pendant at the end of the adjustment chain, which features the LFL stamp. 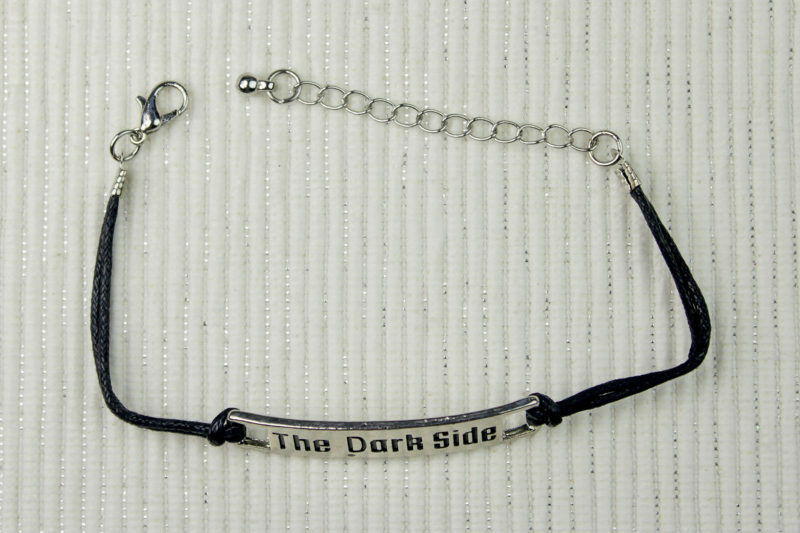 The Dark Side bracelet features a flat silver tone panel pendant, with the text ‘The Dark Side’. The text is recessed, and accented with black. The surface of the pendant has subtle texture, which matches the style of the bracelet set. The pendant measures approximately 1cm wide by 3.1cm long, or 4.4cm long if you include the end loop holes (measured curved). 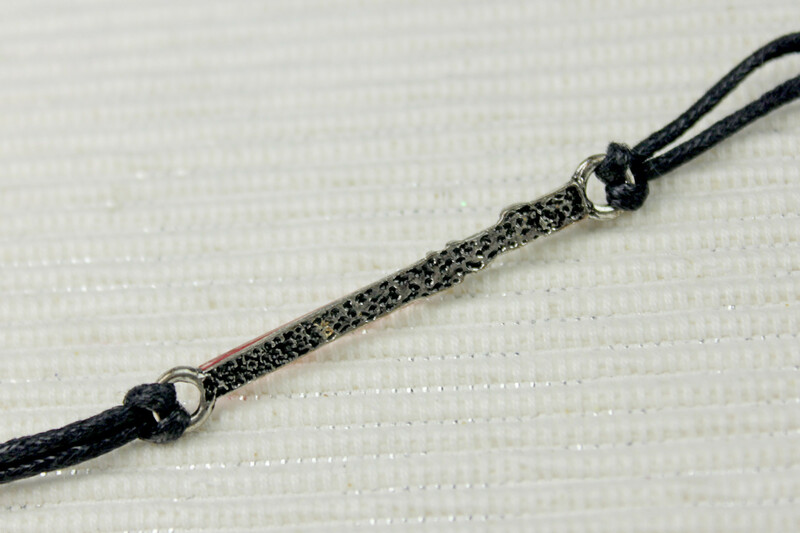 This is the only pendant which has a curve in it – being the longest pendant in the set, the curve helps it sit better against your wrist when worn. The back is stamped with the ‘©LFL’ copyright stamp. 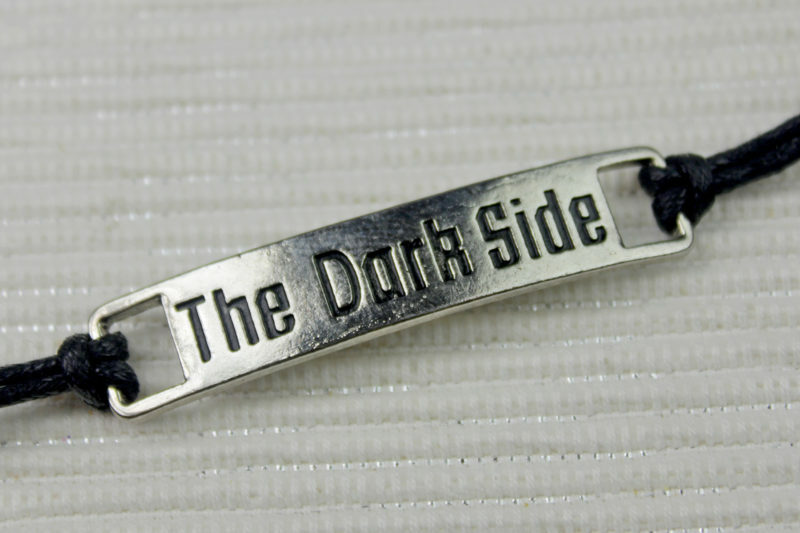 The text ‘The Dark Side’ on its own isn’t copyrighted/trademarked etc, but as part of a licensed set, the copyright mark helps distinguish the bracelet from any similar fan-made versions. 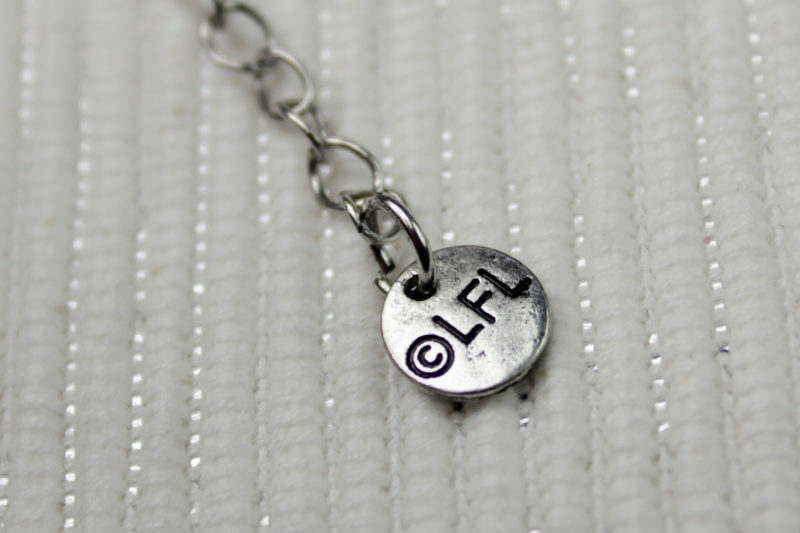 The back of the pendant is hollow, and features the standard ‘© LFL’ copyright stamp. The back hollow is also accented with black antiquing, just like the front. This keeps a uniform appearance, even though of course the back isn’t seen when worn. The pendant measures approximately 2cm by 2cm (at the widest parts, not including the end rings). 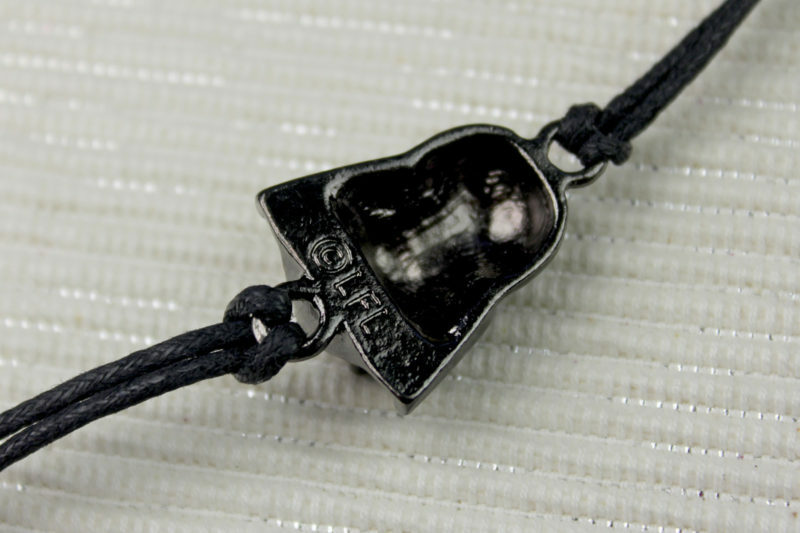 If you aren’t a fan of the black cord (or the sizing of the bracelet), you can remove the central pendant and create your own bracelet. Etsy seller BeadTwisted have used these pendants in some of their own bead bracelet designs, like the Darth Vader and Death Star for example. All in all, I’m very happy with this bracelet set. For a great affordable price, you get 4 bracelets that you can mix and match – wear all 4 together, or one at time. 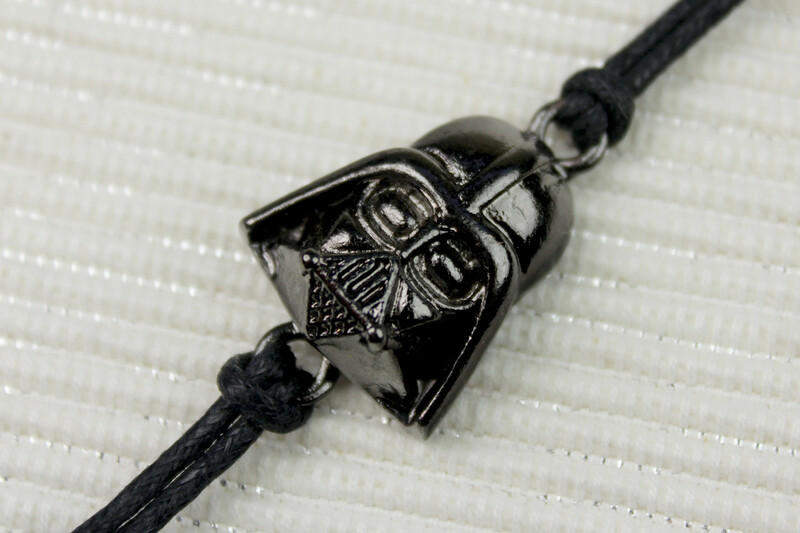 Perfect for adding some Dark Side cool to your outfit.